A Viking nobleman seeks to find a renewed sense of purpose and honor after a disastrous raiding campaign. spending time with an old hermit that will not reveal his name,but nevertheless is clearly a former Viking warrior of great renown, Angus Ovarssen takes up the challenge of service as a Varangian Guard officer in the Christian Byzantine Empire. Once again he engages in brutal warfare and sees the horrors of Dark Age warfare. Ants in the Sun is filled with excitement, bold and daring adventure, passionate love and romance, personal growth, and the horrors of Dark Age combat. This is a must read for readers desiring a book not only filled with action, but a book that is deeply riveting and brings to life the human nature and character of the people of the time period in which it is set. 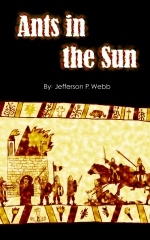 Posted byjeffersonwebb August 13, 2011 January 6, 2012 Posted inUncategorizedTags: Adventure, Ants in the Sun, Byzantine Empire, Christian, Constantinople, Dark Age Combat, Dark Ages, Norwegian, Pagan, Spirituality, Varangian Guard, Viking Raids, Vikings1 Comment on NOW AVAILABLE!! !